Turkey Day is next week, folks! Are you all set? Not here. I should really make a grocery list. Thinking about making that list got me to thinking about a list for today, so I've compiled my favorite Thanksgiving foods. There's some saying about killing two birds with one stone, right? Well, I'm not using any stones but technically this list will ultimately kill three birds: the one that actually ends up on the dinner table, as well as one to make this list and one on the shopping list. Poor turkeys! Mashed Potatoes--I like mine with lots of butter and some garlic in them! Stuffing--Actually I call it that, but I prefer not to stuff it inside the bird, so I guess technically it's dressing. Turkey--I put a few whole carrots, a couple of celery stalks and some garlic cloves inside to roast it. Then the garlic gets smashed up in the mashed potatoes. Cranberry dressing--I've taught Frances my mother-in-law's secret recipe. Ken claims it is neither secret nor a recipe, but I think it makes Frances feel a littler closer to her Grams (who is no longer with us). Fruit Salad--This one doesn't always make it to the table, but when it does, I like to mix some tropical fruit with some whipped cream and pretend it's healthy! Green Bean Casserole--technically this started out as Ken's favorite, but I have grown to like it too. The only problem with making it is trying to keep the fried onions away from Ken until I've used what I need. A relish tray full of sweet pickles, dill pickles, black olives and green olives. We like to put the olives on our fingers and wiggle them at each other. Wait!! I mean THE KIDS! The kids do that. And I scold them...thoroughly. Pie--Not pumpkin or anything, but I'll eat apple or cherry pie. I just like leaving all the pumpkin pie for the rest of you to enjoy. I'm generous like that. My cranberry sherbet story: This was my grandmother's thing. It's exactly what it sounds like. A delicious sherbet made from cranberries. It's the perfect ending to a big meal, because as Grandma always explained, it trickles down in all the spaces between the food in your belly and helps settle it down so you don't feel as full. 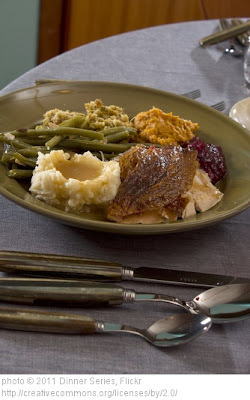 Now, I don't eat Thanksgiving dinner with my family and Grandma's not around to make the sherbet. I also should tell on our former neighbor growing up. Myrtle lived next door to us and had standing permission to get get veggies out of our garden because we always had too much. She also used to eat the raspberries, which was fine, as well. One year she had Thanksgiving dinner with us and someone offered her some cranberry sherbet. She declined, saying, "The seeds get stuck in my teeth and I don't like that." We were polite enough not to ask if all the raspberry seeds got stuck in her teeth as well. What is your favorite thing to eat for Thanksgiving? Who does the cooking and where do you eat?